Was Nazi Germany’s military leadership truly undermined by Adolf Hitler’s erratic decision making? 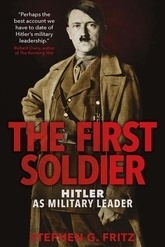 In The First Soldier, Stephen Fritz upends the common characterization of Hitler as an ill-informed fantasist and demonstrates the ways in which his strategy was coherent and even competent. Hitler’s fanatical drive to build a Thousand-Year Reich is uncontroversial. But while his generals did sometimes object to Hitler’s tactics and operational direction, they often made the same errors in judgment and were in agreement regarding larger strategic and political goals. As controversial as it is illuminating, The First Soldier re-frames the narrative to offer a fresh new perspective on the ultimate failure of Germany’s military leadership.